The Christmas Mouse has eight year round locations, plus temporary shops open during the peak holiday season. They are all richly decorated with an assortment of over 28,000 different ornaments, collectibles and accessories. Located in Williamsburg, Virginia our store at 1991 Richmond Road is considered our flagship store. Founded in 1985, the Christmas Mouse soon outgrew its first location in Williamsburg and moved to its current 10,000 square foot location. We invite you to discover Williamsburg and plan a store visit soon! Since 1987 Christmas Mouse has been serving the Outer Banks of North Carolina. Our store at Mile Post 10.5 in Nags Head is an annual stop for many beach-goers. With over 8,000 square feet it is the largest year round Christmas shop on the island. 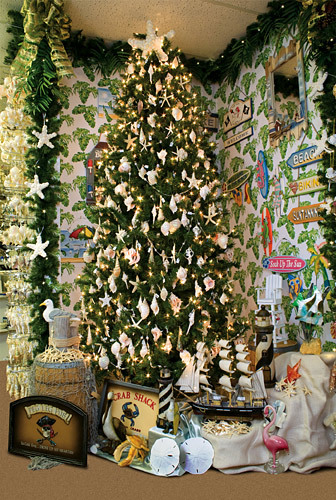 You can also enjoy our nautical room where you will find hundreds of Outer Banks Christmas ornaments and souvenirs. Located along the Intracoastal Waterway in North Myrtle Beach, South Carolina, the Christmas Mouse has been an anchor tenant at Barefoot Landing for thirty years. This store sets itself apart with a staircase that leads to a beautifully decorated tree with gold ornaments accented with Swarovski crystals. It also carries a large selection of personalized ornaments and plenty of nautical ornaments for those vacationing in the Grand Strand. A year after opening our location in North Myrtle Beach in 1988, we found the perfect location on Highway 17 in Myrtle Beach, South Carolina. This free standing location attracts both visitors and locals with friendly customer service and of course a vast selection of Christmas decorations. Five miles outside of Williamsburg, you will discover the sleepy village of Norge, VA. With 4,700 square feet of retail space dedicated to Christmas, many local and regional travelers prefer the tranquil pace and personalized attention while shopping here. The Christmas Mouse is located on Route 60 in Norge. You can not miss the red barn richly decorated with garland, red bows and accent lights. Our Duck, North Carolina store is located in the Scarborough Lane Shops. The 4000 square foot store features a large selection of nautical ornaments. It also caters to vacationers who populate the northern end of the Outer Banks. Located on 11th and Atlantic, our store in Virginia Beach, Virginia is just a block from the Atlantic Ocean. In the midst of what seems like a thousand surf shops, Christmas Mouse provides shoppers with a great selection of Christmas ornaments and decorations. Take home one of the many personalized Christmas ornaments to remember your vacation. Our newest location and also our smallest at 2,700 square feet is located in the Hammock Shops at Pawleys Island, South Carolina. What the store lacks in size, it doubles in charm. Our Christmas trees and decorations are surrounded by a Tobacco Barn that was constructed in 1900. The barn is registered with the State Historic Preservation Office and provides a charming backdrop for a Christmas store.